Roberto Firmino has been a key player for Liverpool since the moment Jurgen Klopp walked through the door and new signing Fabinho has already noted why. Fabinho breaking into the team over the past couple of months, along with fellow summer signing Alisson, means the Reds now have three Brazilians in the starting XI on a regular basis. The triumvirate are all vital additions in their own parts of the pitch—but Firmino’s area seems to be everywhere at once at times, such is the breadth of qualities he brings to the side. Centre-forward last year and somewhat deeper this year, his role has changed but the No. 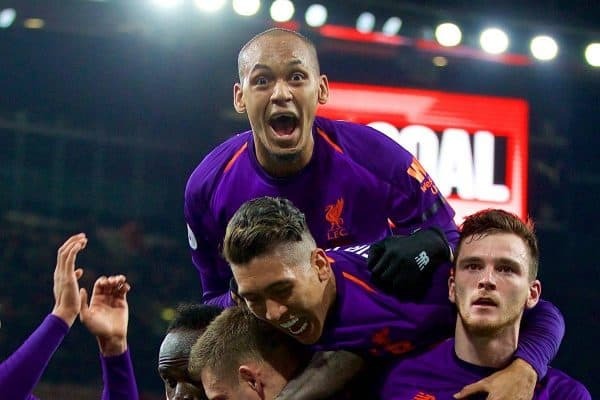 9 remains an integral part of the Reds’ jigsaw and Fabinho told LiverpoolFC.com that his versatility is critical to the success the team are enjoying this season. “Firmino is a player who is really good at adapting to different positions. He is a No.9 but he helps a lot in build-up play. 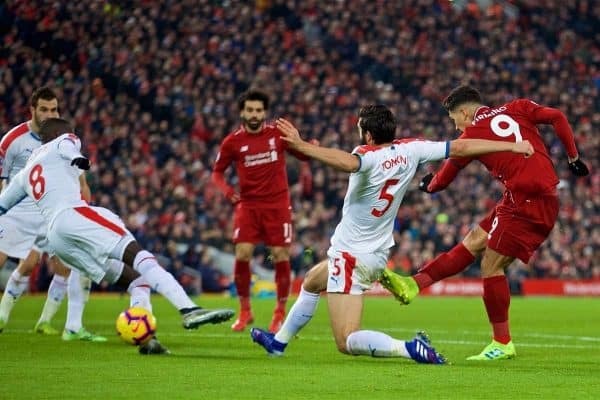 Firmino has 11 goals to his name this term, as well as three Premier League assists, and if he took a little time to get fully back to his best level earlier in the season, he certainly seems in full flow now. A hat-trick against Arsenal has been followed up by another strike against Man City and one in the wild win over Crystal Palace, making it five goals in his last four league games. Fabinho says that productivity highlights what a danger he is as an attacker, but lauds the other, more selfless, side of Firmino’s game too. “He is great at playing with his back to goal and, like I said, in build-up play and starting attacks. He helps a lot in general teamwork as well as being a top finisher. So, yes, he is a really important player for us. “He is a player who, outside the box, is really smart and he makes the team tick. In the box, his finishing is indisputably good, both with his right foot, left foot and in the air. Having scored 27 in all competitions last season, Firmino should be reasonably confident of hitting the 20-goal mark again in 18/19. If he does so, it will be a significant career milestone: the first time he has ever hit 20 or more in back-to-back campaigns. 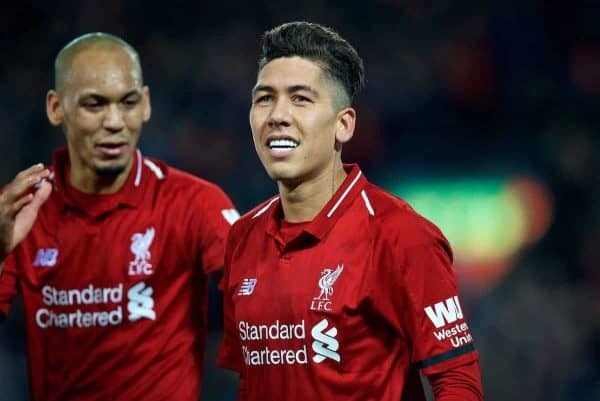 Watching Firmino on the pitch, it’s not hard to see how he is so hugely appreciated by his manager and, as Fabinho demonstrates, by his team-mates. His relentless endeavour and off-the-ball movement arguably highlight the two biggest traits of Klopp’s team as a whole, and he—all three Brazilians, in fact—will have proven utterly crucial should Liverpool go on to lift the Premier League title.